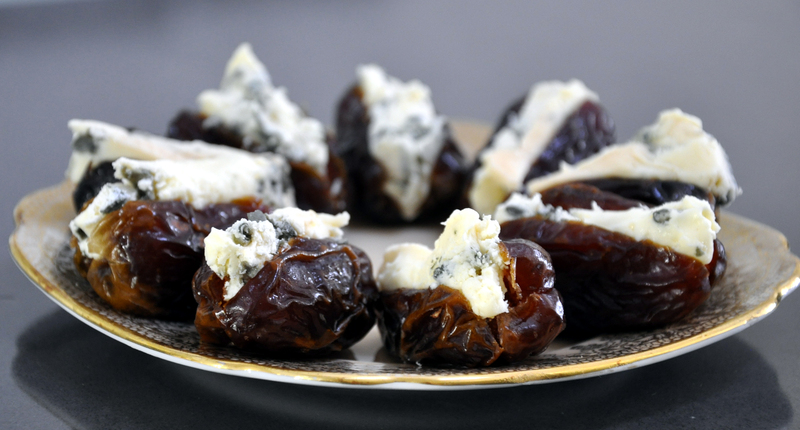 Dates + Blue Cheese = Yum! This is too simple and too good to be true! My good friend Christine introduced me to these delicious hors d’ouevres. They are so simple to make, Chris has been known to prepare these tasty morsels in the passenger seat of the car while her husband drives. The sweet soft date and the piquant, buttery cheese complement each other well, so well it’s hard to stop at just one piece. 125g soft blue cheese such as Gorgonzola dolce. Make a slit in the side of each date and remove the pip. Poke a generous portion of blue cheese into the date. I can see how sweet and salty/cheese combination can be a winner. Persians insert walnut and dip it in coconut fine grind to offer with tea. 😀 Fae. I might try the Persian option, it sounds good. Sandra, my boys are always accusing me of having kept them from discovering the fabulousness of blue vein cheese. Mouldy cheese,l I called it and put them off. Now they are adults and try to coax me into giving it a go, but I think that I am psychologically blocked. I can however earn myself some brownie points by passing this recipe on to my sons. 🙂 Or I might try making your recipe using a different cheese. Three words – yum, yum and yum! I am definitely going to try these!! This entry was posted on January 17, 2013 by ladyredspecs in Food, Gluten Free, Light Savoury Dishes and tagged blue cheese, date, hors d'ouevre, snacks.